LEE MINHO X SONG FOR YOU: Anyone who comes down to the event and purchase a “Song for You” album will be entitled to a chance of getting an exclusive autographed album by Lee MinHo! Also, we will be giving you an exclusive Lee Min Ho Poster when you purchase the album! ROYAL PIRATES X LOVE TOXIC: Anyone who buys the album from us on the event day will get the exclusive Royal Pirates autographed set of postcards!! 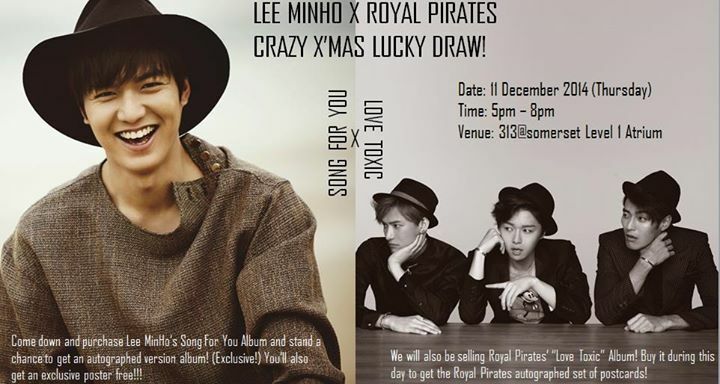 Universal Music Singapore Regional will also be selling Lee MinHo’s “Song For You” Album as well as Royal Pirates’ “Love Toxic” Album on the event day! Singapore – LEEMINHO Global Tour 2014 <Re: Minho> has officially been postponed to a later date which has yet to be confirmed. Seoul Girls Collection (Korea), the main organiser, has made an official release on the change in the status of the event. For more information on ticketing or refunds, please visit www.sportshub.com.sg or call Sportshub Tix at 6333 5000 or 3158 7888 or email them at enquiry@sportshubtix.com. Singapore – Seoul Girls Collection (Korea) is proud to present LEEMINHO Global Tour 2014 <Re: Minho> Singapore at the Singapore Indoor Stadium on the 9th November 2014. Event begins at 7.00pm and will run for 120mintues. Sportshub Tix is the official ticketing agent for this event. Ticket sales will commence on 10th October 2014, on Sportshub Tix website, Indoor Stadium box office and all Sportshub tix outlets at 10am. 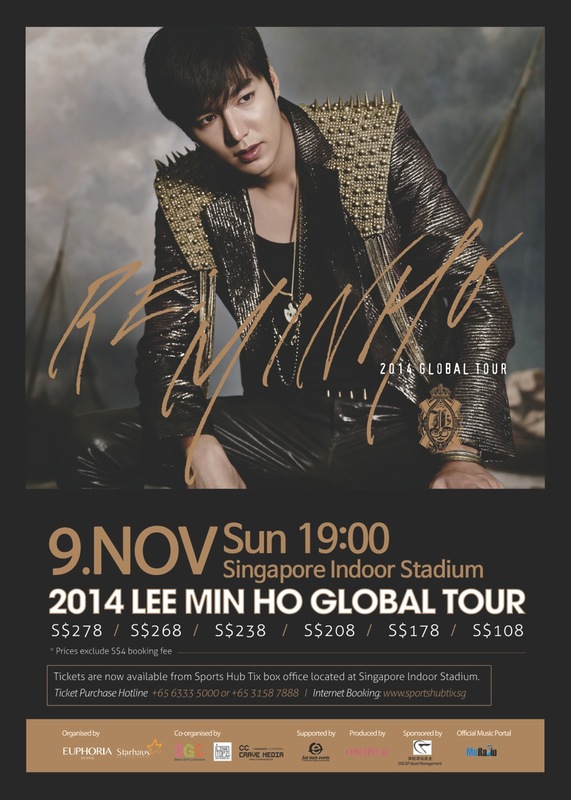 LEEMINHO Global Tour 2014 with the Title <Re: Minho> will be here in Singapore on the 9th November 2014. <Re: Minho> tour began on the 4th October 2014 in Beijing. After which Lee Min Ho will be touring the other cities in China, followed by Japan and Singapore for his South East Asia leg of the tour. Travelling along with him for this tour as a guest performance is the 3 member rock band – Royal Pirates. Royal Pirates will be playing their hottest track for this show and to make it a little more interesting, they will be also performing together with Lee Min Ho. Lee Min Ho, also known as the K-Drama prince will be the first Korean actor to have his own full length concert tour. Fans can expect Lee Min Ho to be performing his latest tracks from his most recent album. The organiser of LEEMINHO Global Tour 2014 <Re: Minho> in Singapore 2014, Seoul Girls Collection (Korea), promise that this will be an exciting and memorable night for all Minoz attending the concert. Ticket Sales opening: 10th October 2014, 10am (online, Indoor Stadium box office and all Sportshub tix outlets. Celebrate OSIM’s 35th Anniversary with Lee Min Ho in Singapore! Singapore, 27 August 2014 – OSIM is pleased to present Lee Min Ho, Korean superstar and drama prince, in Singapore on 27 September 2014 to celebrate OSIM’s 35th anniversary. We invite you to come and celebrate this joyous occasion together with OSIM and Lee Min Ho, who is the face of OSIM’s chic massage sofa, uDiva. The charming star recently starred in the popular drama “The Inheritors”, which drew legions of fans all over the world. Lee Min Ho has set hearts yet a flutter by becoming the latest celebrity endorser for OSIM’s triple enjoyment massage sofa that can transform into a relaxing lounger or a full-body massage chair. Lee enjoys the OSIM uDiva’s state-of-the-art 3D Power-Ball massage technology as it packs an intense, precise and effective massage to soothe and energize his tired body after a full day of acting. Since his endorsement of OSIM uDiva, OSIM has received numerous requests from customers asking to meet Lee Min Ho in person in Singapore. They will be treated to a meet-and-greet session titled ‘Celebrate OSIM’s 35th Anniversary with Lee Min Ho’ on 27 September. Lee will also be toasting champagne with OSIM to celebrate 35 years of success in well-being. The public will get to meet Lee Min Ho at this highly anticipated date held at Causeway Point. Apart from getting up close with Lee through games and activities, 35 lucky uDiva customers will have a special photo opportunity with the Korean heartthrob, and share why they love the OSIM uDiva.